PRP contains a rich suspension of activated platelets, and these platelets are the reservoir of multiple growth factors including the ones which signal hair growth as well as increase the blood flow to the scalp. Also the treatments which deliver the PRP into the scalp (microneedling / Dermaroller) also promote blood flow into the scalp, bringing vital nutrients to the hair roots. How is the PRP treatment done? Usually three to six treatments of PRP are advised, with one month intervals between the sessions. However, treatments are usually customised based on individual needs. Do meet your dermatologist to get an accurate treatment regime. You can appreciate a fuzzy hair growth over the treatment area as early as three months after your first session, however, further maintainence treatments are recommended till desired results are obtained. Though PRP is very effective, it may not be the only or the correct option for people with advanced hair loss. Your dermatologist can suggest other options to you if you do have advanced hair loss. As PRP uses your own blood, this treatment is free from the risk of allergies and allergic reactions. However, be sure to choose an experienced dermatologist to deliver your injectable treatments. PRP has to be delivered to the roots of the hair to be effective. 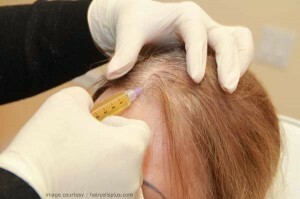 Therefore, just application of PRP over the skin of the scalp will not suffice. This makes it necessary to use micro injections and microneedle delivery systems. The sensation caused by these is usually uncomfortable, but not unbearable. Speak to Dr. Rasya Dixit to know more about PRP therapy. Hair loss is a very common condition that affects both men and women. It can be caused by certain disease conditions, chemotherapy as well as improper diet and stress. Big metropolitan cities like Bangalore are throwing up an increasing number of cases of hair loss. Many of these cases can be directly related to increased work pressures, changing lifestyles as well as inappropriate diets. And with no one ready to part with their crowning glory – their hair, most people are looking for options to restore their head of hair and get their youthful look back again. But people aren’t aware about the latest therapy for this; it’s called Platelet Rich Plasma (PRP) therapy. You can easily access this PRP hair treatment in Bangalore at the Dr Dixit Cosmetic Dermatology clinic. The PRP therapy process is very simple and involves using the patient’s own blood, extracting plasma from it, activating it, and then injecting it back into the scalp through a process of microneedling and microinjections. Depending on the patient, 3 to 6 sessions may be required, with a month’s gap in-between each session. Dr Rasya Dixit is highly experienced in this PRP hair treatment in Bangalore and is a well-known dermatologist in the city. The therapy works by providing hair growth factors as well as replenishing blood supply to the scalp and bringing in vital nutrients to the hair roots. Though it might take a month or so before you start seeing a fresh layer of fuzz growing, this therapy is very effective. However, you should only go to an experienced dermatologist for this PRP hair treatment in Bangalore.